I felt like running tonight so I did my four mile recovery run. It was after 8:30pm so the weather was nice, but it was pretty dark outside. 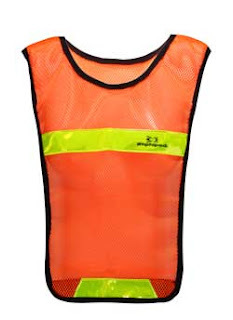 My wife insisted that I wear a reflector vest. The biggest difference in running at night and in the morning is dealing with everything you ate and drank all day. This is why I don't like running night time races. Anyway, I was only running a slow recovery pace so it was not bad at all (10:18, 10:35, 10:35, 10:40). I got back home took a shower and felt really good. I am planning on getting up in the morning for Boot Camp so I am going to make this entry short.